We have started to let my daughter cook simple things with us in the kitchen. Not only is she learning about kitchen safety, food prep, and what goes into making a meal; but we are also spending quality time together! 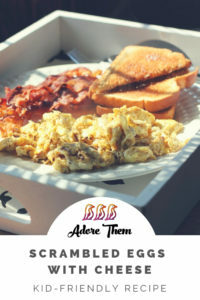 Below is one of her favorite breakfast recipes. It is pretty easy to make, and now she can cook it all by herself in the morning!